The paper, "Cross-modality information transfer: A hypothesis about the relationship among prehistoric cave paintings, symbolic thinking, and the emergence of language," is being published in the journal Frontiers in Psychology. The authors are Miyagawa; Cora Lesure, a Ph.D. student in MIT's Department of Linguistics; and Vitor A. Nobrega, a Ph.D. student in linguistics at the University of Sao Paulo, in Brazil. While the world's best-known cave art exists in France and Spain, examples of it abound throughout the world. 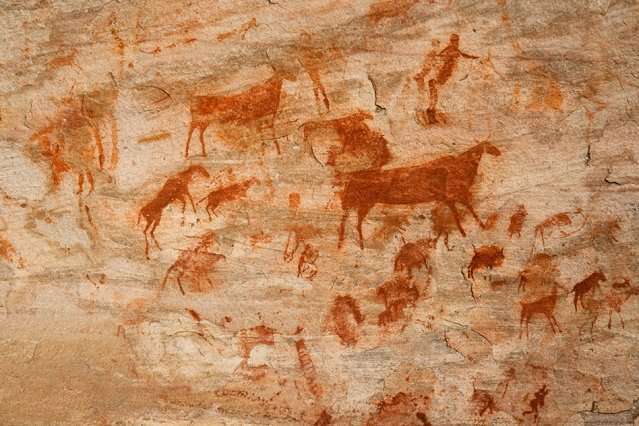 One form of cave art suggestive of symbolic thinking—geometric engravings on pieces of ochre, from the Blombos Cave in southern Africa—has been estimated to be at least 70,000 years old. Such symbolic art indicates a cognitive capacity that humans took with them to the rest of the world. "Cave art is everywhere," Miyagawa says. "Every major continent inhabited by homo sapiens has cave art. … You find it in Europe, in the Middle East, in Asia, everywhere, just like human language." In recent years, for instance, scholars have catalogued Indonesian cave art they believe to be roughly 40,000 years old, older than the best-known examples of European cave art. In any of these scenarios, Miyagawa suggests, cave art displays properties of language in that "you have action, objects, and modification." This parallels some of the universal features of human language—verbs, nouns, and adjectives—and Miyagawa suggests that "acoustically based cave art must have had a hand in forming our cognitive symbolic mind." The long-term timeline of cave art is also subject to re-evaluation on the basis of any future discoveries. If cave art is implicated in the development of human language, finding and properly dating the oldest known such drawings would help us place the orgins of language in human history—which may have happened fairly early on in our development. "If this is on the right track, it's quite possible that … cross-modality transfer helped develop a symbolic mind," Miyagawa says. In that case, he adds, "art is not just something that is marginal to our culture, but central to the formation of our cognitive abilities." Look for half coconut shells. Here's the whole article: cave art is often located in acoustic "hot spots"
We have two minds. One expresses technology as monotone. The other is like animal calls expressing emotion (singing). Symbolic sentences show up in geometric decorations on fabric and pottery. Cave art was done outside the cave. Inside the cave, art was a hunters quiet mind painting what they saw on the rock in one try. Acoustic responses are hard wired in the mind. Clear your throat and someone nearby will too if you are both using the quiet mind that walks paths. We are most adept at sign language as typing is often over a hundred words a minute. That skill came from evolution. Cave art is without human form because we are hidden by instinct. Unlike primates that live in trees or vertical terrain we slip through savanna and forrest. We are camouflaged. Even today we wear clothing to satisfy the instinct to hide as a group. Didgeridoo music cause animals to look. Pentatonic bone flutes can be used to hunt. Both objects are over 35K years old. Cave pictographic language is unknown. A good read is "Origins Revisited" by Leakey. Can you imagine a recent talkative modern inventive man with ancient man? The new guy stands up and shouts "Deer"!!!!!!!!! Using a one word noun, adjective and verb, lunch and everyone else take off running? Picture strip sentences are common in modern times showing mental organization. Cave art shows the feelings and mind of the artist participants. Can you imagine a didgeridoo in one of those caves? I call bs. Primates have communicated since they've existed and we've just extended and refined that natural function. Art has nothing to do with the matter. Physorg seems increasingly laden with hogwash articles of this sort. Pity. "acoustically based cave art must have had a hand in forming our cognitive symbolic mind"
Wrong. Acoustically based singing and responsive chanting leading to dancing and trancing in every culture on Earth doesn't need a cave. However, if you were going to scare the pants off of 'initiates' no where better than a dark echoey cave. And, as usual, scholars neglect to mention Sign Language, which can be learned earlier than spoken language, and has been shown to have every nuance of spoken language. Sign Language was the lingua franca of the Native Plains Indians in the Continental US, shared by tribes that SPOKE 32+ different languages. So, the evolution of vocal cords seems a worthy pursuit, but language is a whole nuther thingy. Hunters can use hand gestures and silence, sign language had to evolve first. Seems obvious that sign language would have been used - gesticulating & pointing to make yourself understood - but sounds would have been used as well since we are naturally noisy animals, as chimps do too - it would just have naturally evolved into ever more complex grunting & gestures until there were understood noises that became 'language' ! I do not see any issue with needing to have some other path to the creation of a language - it IS just an understood series of sounds after all, no longer needing actual physical gestures as well in most cases, altho we do throw those in too sometimes !! !